Saint Padre Pio of Pietrelcina (1887-1968) often worked through people's guardian angels to help them. An Italian priest who became famous worldwide for his stigmata, mystical miracles, and emphasis on prayer, St. Padre Pio communicated with angels frequently. "Send me your guardian angel," he would tell those who asked him for help solving problems in their lives. Here's how Padre Pio sent messages through angels, and some of his quotes about them. Guardian angels are constantly present with people throughout their entire lifetimes, Padre Pio declared. He wrote in a letter to someone who had asked for prayer, Raffaelina Cerase: "How close to us stands one of the celestial spirits, who from the cradle to the grave never leaves us for an instant. He guides us, he protects us like a friend, like a brother. This should be a source of constant consolation for us, especially during the saddest times of our lives." Padre Pio said that he was grateful for his own guardian angel's presence in every situation, no matter how difficult the circumstances. During his childhood, he recalled, he had gotten to know his guardian angel through prayer and meditation and developed a close bond of his friendship with his angel. "My guardian angel has been my friend since my infancy," he said. Many people tend to neglect thinking about their guardian angel companions because the angels are usually invisible (so they don't frighten or distract us). Padre Pio said that he was guilty of neglecting his angel, too, even though he paid far more attention to his angel than most people do. He wrote to Raffaelina that he regretted not thinking of his guardian angel watching him when he gave into temptations to sin: "How many times, alas, have I made this good angel weep! How many times have I lived without the least fear of offending the purity of his regard! Oh, he is so finely mannered, so discreet. My God, how many times did I respond to the ample, more than maternal care of this good angel without any sign of respect, affection or acknowledgment!" Usually, however, Padre Pio said that his friendship with the angel whom God had assigned to watch over him was a source of great joy and encouragement. He often spoke about his guardian angel having a great sense of humor and said he looked forward to their conversations, which happened most often while Padre Pio was praying or meditating. "Oh delicious intimacy! Oh happy company!" Padre Pio wrote of how much he enjoyed his relationship with his guardian angel. Since Padre Pio knew how much his own guardian angel paid attention to what he was going through in all kinds of circumstances, he realized that everyone's guardian angels naturally care about what happens to them day by day. He encouraged the people who asked him to pray for their suffering that their guardian angels saw their pain and prayed for them, asking God to bring good purposes out of the bad circumstances they have experienced. "Your tears were collected by angels and were placed in a gold chalice, and you will find them when you present yourself before God," Padre Pio once said. 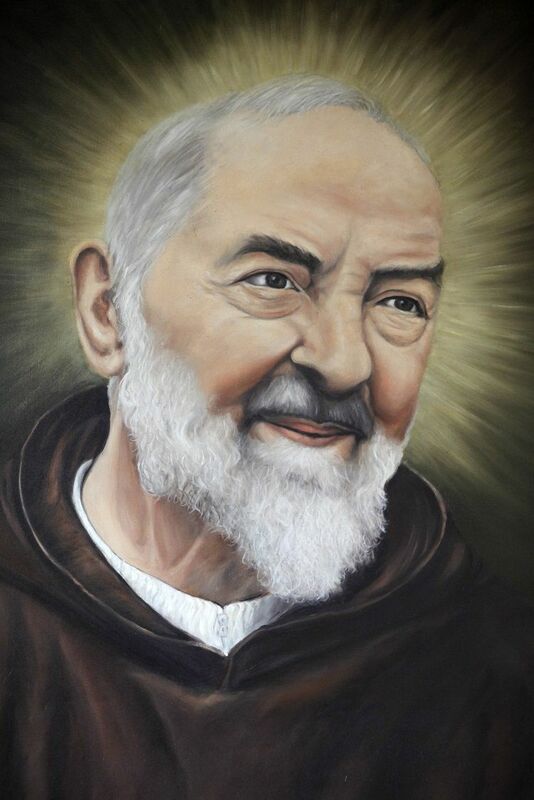 Padre Pio experienced the intense suffering of attacks from Satan (some of which involved Satan manifesting physically and fighting Padre Pio so hard that the priest had bruises afterward), he said. During those experiences, Padre Pio's guardian angel comforted him, but didn't prevent the attacks because God had allowed them for the purpose of strengthening his faith. "The devil wants to defeat me but he will be crushed," Padre Pio once said. "My guardian angel assures me that God is with us." Since guardian angels are expert messengers whom God has designed to communicate back and forth with him and human beings, they provide trustworthy and valuable help delivering messages in prayer. Padre Pio often enlisted guardian angels' help to pass messages along that would promote the spiritual growth of the people who wrote to him or talked with him in the confessional booth at his church in San Giovanni Rotondo, Italy. When an American woman wrote to Padre Pio for advice, he told her to send him her guardian angel to discuss the matter, and she wrote back expressing doubt that her guardian angel would actually come to visit him in Italy. Padre Pio told his mail assistant to reply: "Tell her that her angel is not like she is. Her angel is very obedient, and when she sends him, he comes!" Padre Pio developed a reputation as a priest who told people the truth no matter what. He reportedly had the psychic gift of being able to read people's minds, and often brought sins to their attention during confession that they hadn't mentioned to him, so they could fully confess before God and receive forgiveness. But, in the process, many people said he made them feel uncomfortable with his knowledge of sins they had thought were secret. Since angels communicate through telepathy (directly mind-to-mind), Padre Pio used his gift of telepathy to communicate with them about the people he met in his confessional booth. He would ask the angels questions about the people they cared for so he could understand them well and give them the best advice about how to solve the specific problems they faced. Padre Pio would also ask the angels to pray for the situations that concerned the people he was trying to help. In the process, Padre Pio relied on his own guardian angel to coordinate all the messages. "Padre Pio's spiritual guidance of souls was mostly done through the help and direction of his guardian angel," writes Father Alessio Parente in his biography of Padre Pio, Send Me Your Guardian Angel: Padre Pio. Padre Pio's guardian angel even acted as an international translator, those who worked with him reported. Witnesses said he never used a human being to translate the letters he received from people around the world that were written in languages he didn't know himself. He simply prayed for help from his angel, and then was able to understand any letter's message and figure out how to reply to it intelligently. Above all, Padre Pio urged people to stay in close contact with their guardian angels through prayer. Guardian angels are eager to help people on a regular basis as God intends them to do, he said, but too often those angels are disappointed that the people they're trying to serve don't reach out to them for much help. By default, guardian angels don't get involved in human lives unless they're invited to (because of respect for free will) or unless God directs them to intervene to protect people in dangerous situations. In a letter, Father Jean Derobert, who became chaplain of the famous Basilica of the Sacred Heart of Jesus in Paris, describes an encounter he had with Padre Pio in which Padre Pio urged him to pray more to his guardian angel: "'Look carefully, he's there and he's very beautiful!' [Padre Pio said]. I turned and of course saw nothing, but he, Padre Pio, had the look on his face of someone who sees something. He was not staring off into space. 'Your guardian angel is there and he's protecting you! Pray heartily to him, pray heartily to him!' His eyes were luminous; they were reflecting the light of my angel." Guardian angels are hoping that people will contact them -- and God hopes so, too. "Invoke your guardian angel that he will illuminate you and will guide you," Padre Pio advised. "God has given him to you for this reason. Therefore use him!" Do You Have Your Own Guardian Angel?